Make the crust In a food processor, pulse the 3 cups of flour with the salt and baking powder until combined. Add the butter and cream cheese and pulse to form coarse crumbs. With the machine on, drizzle in the water until the dough starts to come together. Transfer to a work surface, gather any crumbs and press into a ball. Divide the dough into 2 equal pieces and pat into disks. Wrap in plastic and refrigerate until firm, 1 hour. Make the filling Preheat the oven to 350°. In a large bowl, combine all of the ingredients. On a lightly floured work surface and using a lightly floured rolling pin, roll out each piece of dough to a 14-inch round, about 1/8 inch thick. 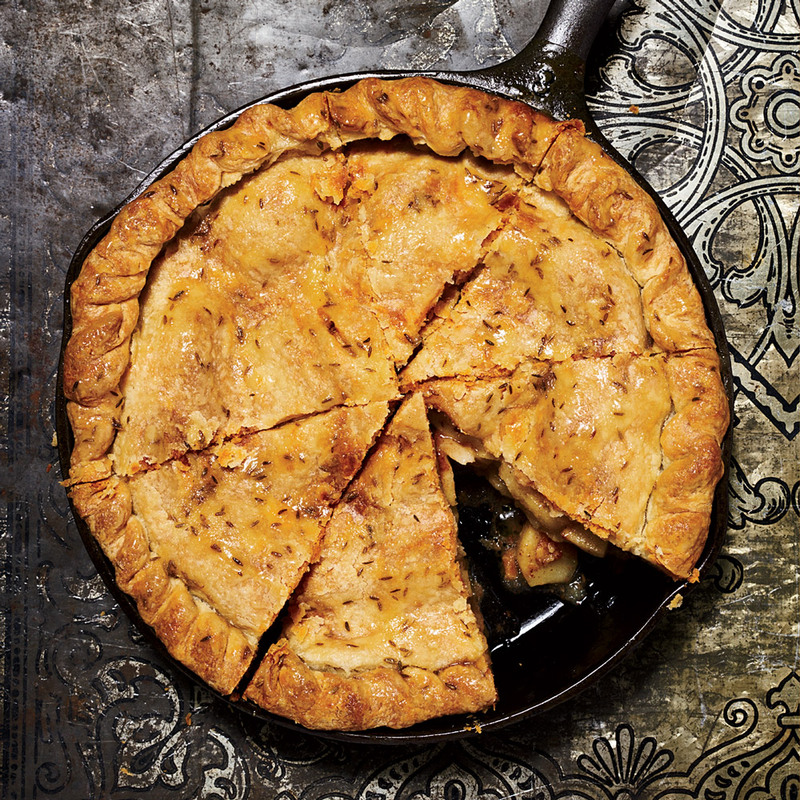 Ease 1 dough round into a 9-inch cast-iron skillet or deep-dish pie plate. Scrape the filling into the skillet and top with the second dough round. Press the edges of the dough together, then trim the overhang to about 1 inch, fold it under itself and crimp decoratively. Cut 4 slits in the top of the pie and bake for about 1 hour and 15 minutes, until golden brown. Transfer to a rack and let cool completely. Meanwhile, make the glaze In a small saucepan, melt the butter. Add the cumin and cook over moderately low heat, stirring, until fragrant, about 1 minute. Add the jaggery and 2 tablespoons of water and cook until the jaggery dissolves and the mixture is slightly thickened, 2 to 3 minutes. Brush some of the glaze over the pie and serve, passing the remaining glaze at the table. The pie can be covered and stored at room temperature overnight. Review Body: Cumin in apple pie? hmm don't know about this one!